When I wake, I turn to look for Him, not knowing what to expect. He is there beside me. The relief is so profound it is almost physical. He is there! He looks at me as if knowing my heart is filled with more questions than answers. He nods, offering to answer my need to know. “What has happened—I do not think I fully understand, Papa.” I breath, just so glad to be at His side again. “Help me please. I just want to get this right, to please you, Papa.” I find I am staring at the ground now unable or unwilling really to lift my head and face Him. Gently, He pats my hand, as if to acknowledge the difficulty and pain I currently feel. “Those two expectations would have destroyed everything you have fought for, everything you have attained. They would slowly eat you alive and would have succeeded had you not chosen to obey.” He explains. I never knew the seriousness of it all, nor would I have believed it. I feel the last bits of my old sense of self crumbling and falling through my fingers. His words hold nothing but truth, there is no denying any of it. “I repent Papa! You’re right, it’s true. I’m so sorry! I have always taken control never actually surrendered it.” I cry to Him. “Please show me how to do this your way. I don’t know how to do this, Papa! Help me!” I am devastated, my heart overpowered by an ache I’ve only felt in the darkness of the abyss. I feel the old patterns calling to me. I fight them off, though not well, wanting only to please Him. Without words, He hands me the pearl that I had left upstairs on the table. “This is a pearl of great price.” He quietly explains, the anger gone from His voice now. Hearing this, I sigh with relief. I take the pearl from Him, holding it in my palm and looking at it in the fresh morning light. How strange something like this could be built out of a wounding, a flaw and yet become so precious. For this first time, I see the pearl as the only gem that does not need cutting, polishing and finishing by man. Finally I begin to see! My value is tied in being His creation, who I am created by not what I am. Because I have been fashioned by His hands I have worth apart from everything else. Nothing no one can change that or take it from me. His work is always rare, precious and perfectly suite to His will. “I will submit, Papa! I will obey You in this.” I whisper, unable to find anything to say, tears trickling down my cheeks. “There is more,” He continues. He gives me a polished gold key. “You gave me the keys to your heart.” He reminds me. 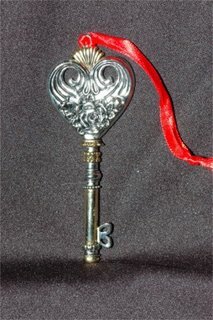 “For your last expectation, in return I give you the key to your dreams, your destiny.” He presses it into my hands with the pearl. I am overcome, having no words to say at all. The only thing I can think, and it embarrasses me deeply, is that I do not now what my dreams are any more. I feel like I have let them all die. Suddenly I feel so lost I cannot help but cry. He pulls me into His arms and just lets me cry for a bit. Quietly He shows me the dreams that He has already brought to pass. Dreams of home and family, education and career, things that I was not really aware of any more. “The dreams are there,” He whispers. “There is a person you struggle with; one who has caused you to believe theirs is the only destiny. But this one is not the only one with a destiny. I have a plan and destiny for you and it is not a secondary one. You are not a second choice, a left over or a make-due-with reject. I have a destiny for you of service to Me, to my people. Your hurts and expectations have made it difficult to dream and to see what I have for you, even to see that you are part of the promise of destiny, but I will show you. Open your heart to see and to dream. And those dreams will not be taken from you and given to another. They are for you and you are made for them.” His voice is soft in my ear, gentle on my aching soul. We walk to the stone that has been the platform for all my expectations, old and new. With a slow deliberateness I begin to gather what He has given me. The feather, the tea-rose, the coins on the chain, the garnet together with the ring on my finger and the final two, the pearl and key. How very different from the bud vase of dead roses that we came with are the objects now in my hands. I realize that I still do not know the full extent of the changes within and it will be some time before I can understand it all. 2Th 1:12 If your life honors the name of Jesus, he will honor you. Grace is behind and through all of this, our God giving himself freely, the Master, Jesus Christ, giving himself freely.